Delivery of special furnaces for the rotary casting of plastics. The furnace device clamps and centers the lockable molds on a rotary table driven by an electric motor. After heating a centrifugal casting of the plastic takes place into the mold. Various cycles for different molds and casting modes are prepared in PLCs. The robotic workplace is designed for semi-automatic 24/7 mode. It is used for the automatic mounting of torsional vibrations shock absorbers for the automotive industry. 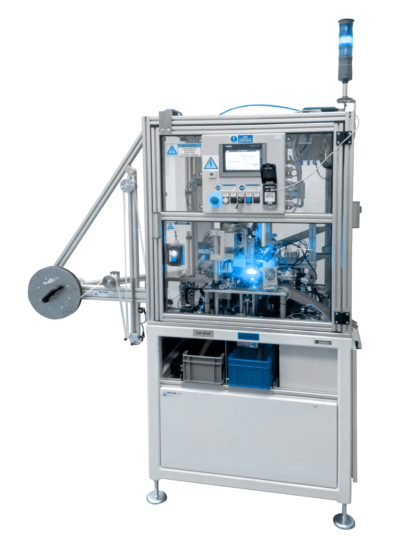 The workplace combines the 6-axis YASKAWA robot and the WEISS electric carousel. The machine also ensures precise pressing by servo press and final camera control. The device can process 4 or more product types. Machine time is 12s / piece. Delivery of new robotic workplace for handling and inserting pipes into a flowmeter testing circuit. The workplace is designed as fully automatic and a 6-axis KUKA robot with a load capacity of 360 kg had been selected for handling. New machine for manipulation and control of silk circles handover. The cutting machines cut out the round silk circles, which are transported by handling machine using a vacuum. Then the camera checks the quality of the cut, circularity and other important parameters and evaluates it. Pieces that the video camera evaluates as defective throw into the NOk box. The machine is designed as semi-automatic for one operator. Semi-automatic single-purpose assembly machine is designed for assembling and checking parts for the automotive industry. Part of the machine is laser soldering with 2 soldering heads EUTECT GmbH. Machine time is 6 seconds. The machine is operated by 1 operator. This line is designed for the production and control of automotive shock absorbers. 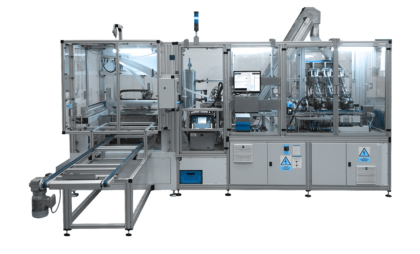 The line is designed as semi-automatic, components are supplied and sub-assemblies are assembled by 2-3 operators. The actual assembly process takes place automatically. 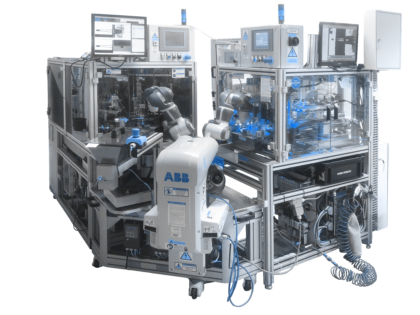 As a part of the line are 6-axis ABB robots, and the SIEMENS S1500 system is used for control. The line machine time is 11 s. The line is additionally equipped with data collection and remote management and diagnostics. 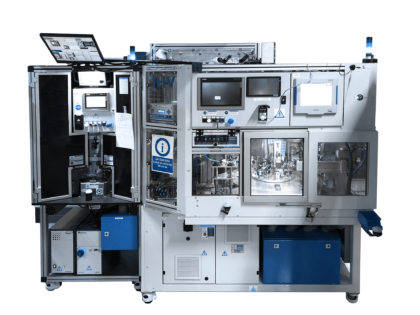 This single-purpose machine welds, fills, controls and presses components for the production of temperature sensors for the automotive industry. 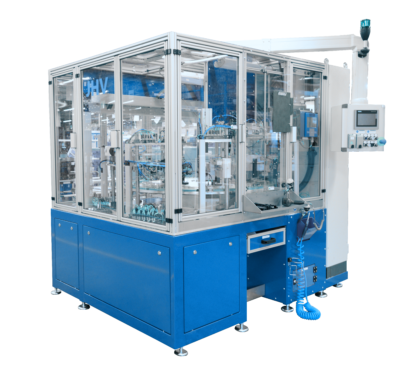 The machine is designed for semi-automatic operation. The operator inserts the component into the carousel and then is exactly filled by the heat-conducting paste. On the left side of the machine is precision welding of thermocouple wires, which is then conveyed to the carousel, assembled and pressed to the final product. 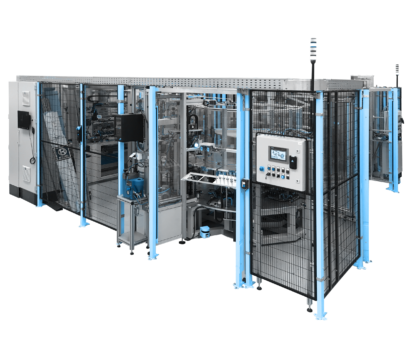 The Siemens PLC is used to control the machine, for precisely position are used the FESTO servo drives. The machine’s machine time is 5 seconds. Dual-arm collaborative robot YuMi integration for two single-purpose machines. 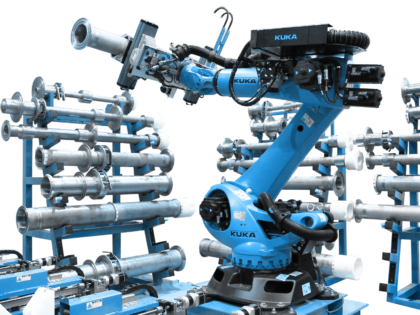 The robot completely replaces work of 2 operators, so the customer´s production can run fully in 24/7 mode. Machine time is 16s and all operations are fully automatic. 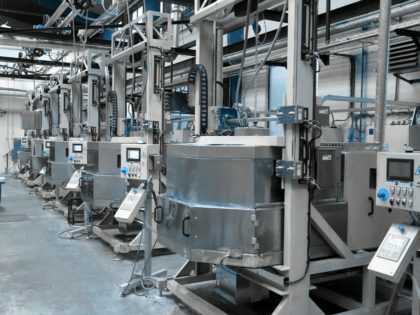 The automatic production line is designed for 24/7 unattended operation mode. Technically designed as a linear conveyor assembly. To fill the line are used vibration feeders and our special untwist machines. The device is designed to assembly 1 type of product. 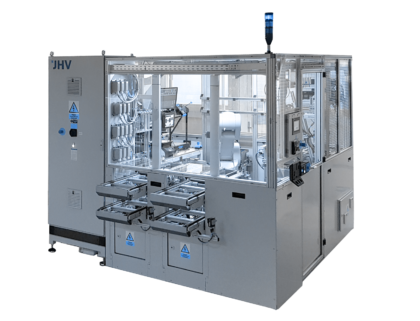 The machine is designed for fully automatic unattended operation in 24/7 mode. The machine time for one part inserting is 0.6s, and the machine’s maximum stroke is 7s per finished piece. 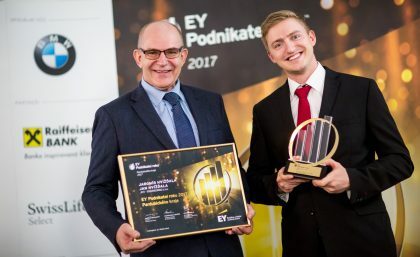 This year we participated in EY Entrepreneur Of The Year competition. 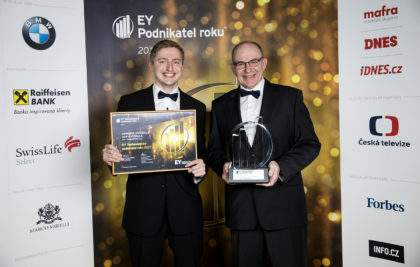 We managed to win the first round and were awarded as EY Entrepreneur Of The Year in Pardubice Region. Now we continue to the national final round! 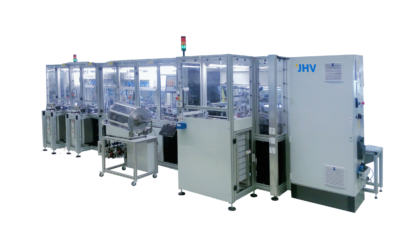 The aim of the project is to substantially extend the research and innovation capacity (RIC) of JHV-ENGINEERING, s.r.o. The project is realized in Pardubice in the current premises of the company at Nádražní 641, Rosice, 533 51 Pardubice. 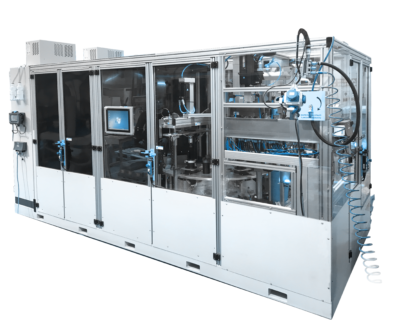 Within the project will be purchased machines used for research and development of the company and SW necessary for providing R & D activities in the field of development of machines and equipment for the fields of automotive, medicine or electroprojection.